this is from my parents' veg patch. it seems enormous! 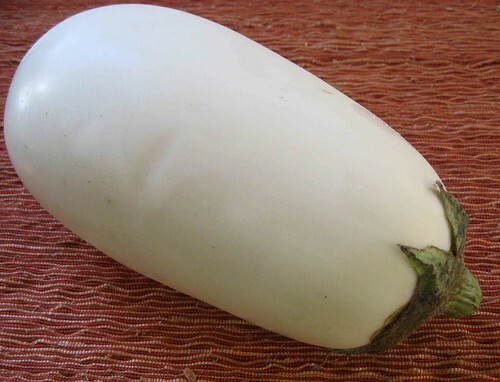 have never cooked with an eggplant so TELL ME WHAT TO DO WITH THIS THING, COOKINGERS. slice/chop, stir fry with chilli, onions, then add some chopped tomatoes, whatever herbs you like with that sort of thing (basil, oregano prolly good picks) and you got a pretty good pasta dish. ^^ I loved that recipe. Am making it again today as a matter of fact. Roast whole until collapsed, mix with chopped garlic, lemon juice, tahini sauce, puree - baba ghanouge. Made some yesterday! fried eggplant is bom but labor intensive, i've had best results with a tempura batter . . .
my gurl hates how eggplant gets soggy in most applications so usually when we have it i 1-2inch cube the eggplant, put em in a big bowl then slosh olive oil and sprinkle salt and pepper. mek sure dem gets nice and coated then put it on a sheet pan and park it in a 350-400F oven for about an hour. flip em halfway if yr feelin frisky, they may develop color on the side that contacts the pan. then you can use these cubes to ramp up yr aglio y olio or put it in salads or whatever you want. The eggplant reduces down to a nice softness so doesn't seem as much as it might appear from the recipe. OH man that one sounds amazingly delish! I'd possibly leave out the chorizo maybe (tho I like chorizo!). Does anyone (dayo?) have a good recipe for "spicy eggplants"? There was a time in my life where I was ordering this at a Thai place as often as I could afford. I loved those freaking spicy eggplants. my mom makes a simple eggplant stirfry with sugar and vinegar, and I end up dipping it in sriracha sauce. oh good i was looking for that recipe! i have an eggplant and a lot of basil and peppers. so that was going to be my recommendation. eggplants = the best vegetable but i never want to cook them. Great ideas here for egg plant. It's one vegetable that I usually avoid because I really haven't had a clue what to do with it up until now. I've heard that if you take the time to learn to cook it nicely it works like nature's <A HREF="http://www.enemakit.com/";>enema</A> and makes you feel so much better. I have to force myself to eat my vegetables but I'm much healthier for it. Great ideas here for egg plant. It's one vegetable that I usually avoid because I really haven't had a clue what to do with it up until now. I've heard that if you take the time to learn to cook it nicely it works like nature's enema and makes you feel so much better. I have to force myself to eat my vegetables but I'm much healthier for it. I subbed sriraracha for all the chilis and peppers. also I need to figure out a better way to fry the eggplant. when I throw the cubes in they just soak up ALL the oil like a sponge. and then they kind of taste like peanut eggplant oil cubes. I talked w my mom and she says it's normal for eggplants to do this. but there's gotta be a better way. maybe I need to get the oil really hot first. and yeah I used rice vinegar instead of white vinegar. I think I added a little bit more sugar too to counteract the sourness. oh, i used pepper flakes this time but i think i used sambal oelek last time. it seems better to do that because flakes can burn. from another recipe i picked up the tip that you should cut them in super irregular shapes with no right angles so when you mix it around it's easy to get the pieces to flip and they don't stick. i get the oil soaking thing too and i think my oil was pretty hot. i give up though. This has been a permanent recipe-replacement for me for a while now. Doesn't get stale or old like dried chilies, works great. I forgot to mention I skipped the basil cuz I didn't have any. my mom's really really good recipe for eggplant is just to stirfry it with vinegar and sugar. comes out tangy-sweet, it's really good. then you dip it in sriracha if you want. when I throw the cubes in they just soak up ALL the oil like a sponge. if you salt your eggplant ahead of time it draws out moisture, but most importantly, imo, eggplant absorbs about 1/3 less oil in the pan (assuming the pan is good and hot to begin with). that is a good tip. I will do that next time. does anybody else just live on these things. i grill them & put them in sandwiches or have them on toast (w/mustard!) most days at the moment. shake some smoked paprika or sumac on them. yeah i was kinda a slow starter with them. i think because the most default preparation methods are pretty boring & lead to a smushy kinda-courgetty thing. grilled or roasted-to-molten-implosion they are a top-tier vegetable. oh man i've still never done that. or really ever had & loved baba ganoush?, even. my main roasted aubergine thing is to do them on a p high heat until they just look battered & bruise, remove, peel (having sliced before putting in oven this is super satisfying & bananalike to do) & add to a risotto, in the last few minutes before serving. it pretty much totally disappears & just adds to the taste & consistency. so good. it is the grilling that has got me so excited recently though, they're so nice texturally, which was never really a huge aubergine strength, & they go really well with spices. Yeah the babaganoush is easy, and I reckon it's actually nicer to eat when you make your own. Store bought is always kinda pukey tasting to me. Just mix in a couple of tbs of tahini, some lemon juice, minced garlic, flat leaf parsley and a bit of salt and that's a good starting point. But you can put spices in it too, like cumin or cayenne or w/e. Grilled eggplant is the bomb. Especially antipasto, god I could eat those all day. I love it sauteed in pasta sauce too. Really nice salad from the Moro book to have a side or as a light lunch with flatbread and leaves... Aubergine with chilli, mint and garlic. Slowly fry aubergine, sorry eggplant, slices in a little olive oil until caramelised and soft. Best results on a griddle pan as it gets less oily and looks purty. You'll need to do these in batches, but that's fine. Just lay the finished ones on a large shallow dish. Then, once they're all done and laid out, make a paste of 1 small garlic clove and a little sea salt, mixing in a splash of red wine vinegar once it's all mashed. Sprinkle this over the eggplant slices. Matchstick a clove of garlic and fry until golden brown and crisp. Then sprinkle your crispy garlic bits over the eggplant. Finally chop up some red chilli and fresh mint leaves and scatter over the eggplant. Set aside for at least an hour so the eggplant soaks in all the flavours. Great as a party snack on some flatbread. Some people like a wee dollop of yogurt on it. I suppose it mellows the attack of garlic and chilli, but then you've already got the cooling mint. Anyway, totally delish, a tried and tested hit. i do the charring of whole Japanese eggplants over my gas grill. put in a bowl when cooked; cover bowl for a few minutes to help make the skin easier to peel. the dressing is roughly 2 parts lime juice: 2 parts fish sauce: 1 part sugar dissolved in equal amount H20. add a touch minced garlic, combine w/eggplant toss in some cilantro and this to me is heavenly. this sounds good. i only just got to the stage w/home made houmous where i feel the benefit over (good) storebought. p sure i mentioned it here or elsewhere but since i got into dark tahini i can't stop using it, it's really versatile & distinct & way more of a-thing than i thought tahini was, based on its anaemic & gloopy younger brother spread. does it keep okay, w/o the roasted eggplant going all congealy? also great recipe stew. i was looking through morro east a couple of weeks ago, all of the flatbread-kinda-stuff looked great. i do the charring of whole Japanese eggplants over my gas grill. this is like aubergine lore to me. my friend tried it and said it just made a total mess? oven roasting fits better w/my concerns over zoning out in the kitchen causing my kitchen to burn to the ground. i think a big ol' globe eggplant would be messy, but i did this today with some little Japanese babies. using two burners the four of them were ready in about 5 minutes and the only mess was about 5 tiny flakes of toasted skin. left covered in a bowl for a few minutes made peeling easier... the result is this completely sublime smokey aubergine salad with zero added fat. Using normal aubergines is pretty messy but if you cover the surrounding area in tin foil it's easy enough to clean up. I wonder if a blowtorch would work? Kind of like how chefs do creme brulee? c'mon man the MTL thread is a plurality, for this thread you must love eggplants to come in & start talking. at least share your eggplant history with us, i don't wanna know that you're trash talking only having eaten sad slow-stewed moist aubergine dishes. i grilled an eggplant last night, so easy & good. ate it with giardiniera on some nice bread. I might make an eggplant and chickpea coconut curry tonight for tea. All this grilling talk, how does it work? How molten does it go? Have been served amazingly soft grilled half aubergine (sliced lengthwise) with miso paste at a japanese restaurant. The menu actually said it was grilled and deep fried but even when i tried deep frying first mine was burning on top under the grill before it got soft enough in the middle. In the absence of getting that to work I've just been cubing and deep frying - still pretty damn good. I fried some cubed eggplant the other day and on a whim threw soy sauce/sesame oil over it and put it on rice and damn it was tasty that way. yeah i normally serve it with soy/mirin/sake, if i'm feeling really wild i'll throw in some miso paste too (50/50 miso/water, toss in pan with the soy & auberge for a couple of mins). 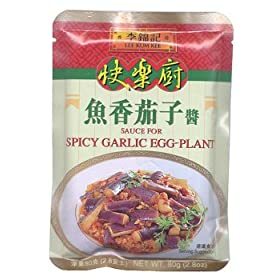 Yeah japanese flavour eggplant never occurred to me before but it works well. I must replenish my mirin, I'm out of stock. Oh and sugar too, with the miso paste at least. my recipe suggests crazy amounts (3tbsp, about the same amount as miso) but the miso (red variety) is sharp so it really needs it. hey well there's grilling & there's roasting; grilling i'm talking just slicing an aubergine and ending up with slightly crunchy discs, which i wish society would understand as a snack & sell on the streets. but to make a molten aub you wanna roast it: some people fire them on the hob wrapped in tinfoil, but i think if you slash a few lines into one, throw it in the oven not super high for an hour, you're able to take it out, peel away the skin banana-style & use the interior sludge for the kind of thing you're talking about. it is formless by that point - grey eggplant lava - but super flavoursome. goes well w/spices. i stir into risottos. i've never really made tangine or anything, which is a good aubergine vehicle, but doing all of this stuff to an eggplant & then getting into mixing it into another recipe is probably a really good move, & might be more like what happens with the soft restaurant aubs you're imagining. cool, hot sludge is what i'm after, mmm hot sludge action. Hot aubergine sludge quest continues. I tried it in a moderately hot oven (gas mark 6/400f/200c), after 15 mins the top was clearly browning too much so i turned it down to 4. After nearly an hour in total it was nowhere near done enough. Tried again wrapping in foil and blasting almost at full heat, took it out after 50 mins and it was getting close, not deliciously molten but just about soft enough to eat with a spoon. What is most perplexing to me about all this is that of the half dozen recipes I've found, the longest any of them say they need to be cooked for is 35 minutes. One says to stick them under the grill for a mere 6 minutes! how long are you preparing it before putting near heat though? so far i've just been scoring the top (of one half aubergine, sliced lengthwise) and brushing with oil. will do. high hopes for miso aubergine version 4.
yeah the salting will help the un-slushiness. trayce that is a beautiful eggplant! Its not very big, its a deceptive photo! This thread made me then go and fry up some eggy and capsicum from my garden for tea with garlic and onion, in ghee, then chuck it over tumeric rice. I think putting it under a heat lamp could aide the hatching process?